For the macaron shells: Preheat the oven to 275°F and line the baking tray with baking paper or use a macaron mat. Put the almond meal into the food processor and pulse, then add the confectioners’ sugar and pulse again to form a fine powder (see figure 1). Transfer to a bowl for later. Put the Oreo halves into the food processor and pulse to a fine crumb. Stir into the almond mixture. Whip the egg whites and salt until foamy, then add the superfine sugar a spoonful at a time. Whip until the mixture forms stiff peaks. 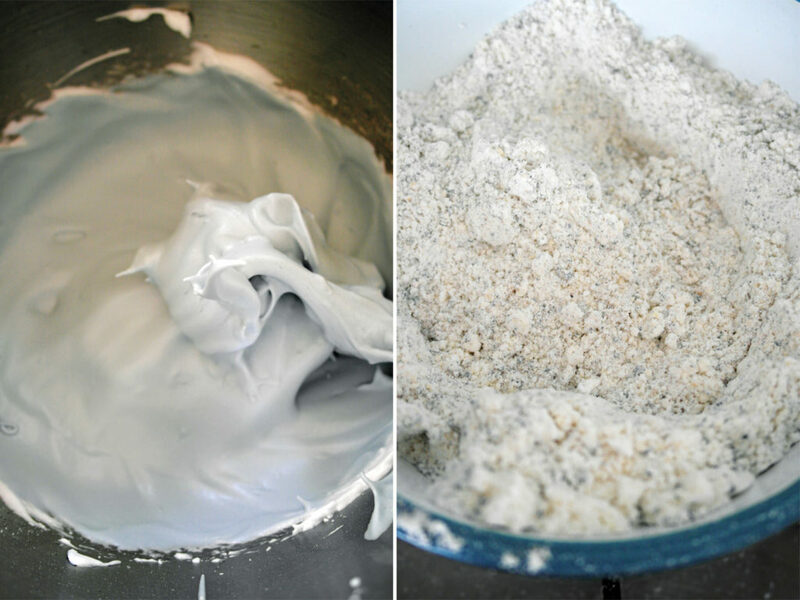 Add a small amount of black food coloring to make the mixture a grey color (see figure 2). Sift in a quarter of the almond mixture and fold in (see figure 3), then repeat until it is all combined (try not to overwork the mixture). Spoon into a piping bag and pipe circles onto the baking tray. Tap the baking tray on the worktop a few times to pop any air bubbles, then leave the macarons for 20–60 minutes to form a skin. 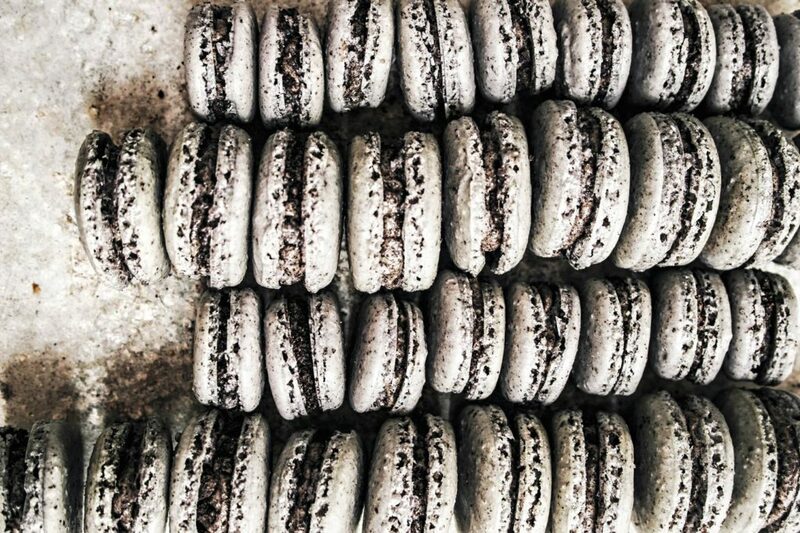 Bake the macarons for 20 minutes and then allow to cool. For the buttercream: Put 10 whole Oreos into the food processor and pulse to a fine crumb. Beat the butter in a bowl until soft, then mix in the confectioners’ sugar and Oreo crumbs (but reserve some of the crumbs for sprinkling). Spoon the buttercream into a piping bag. 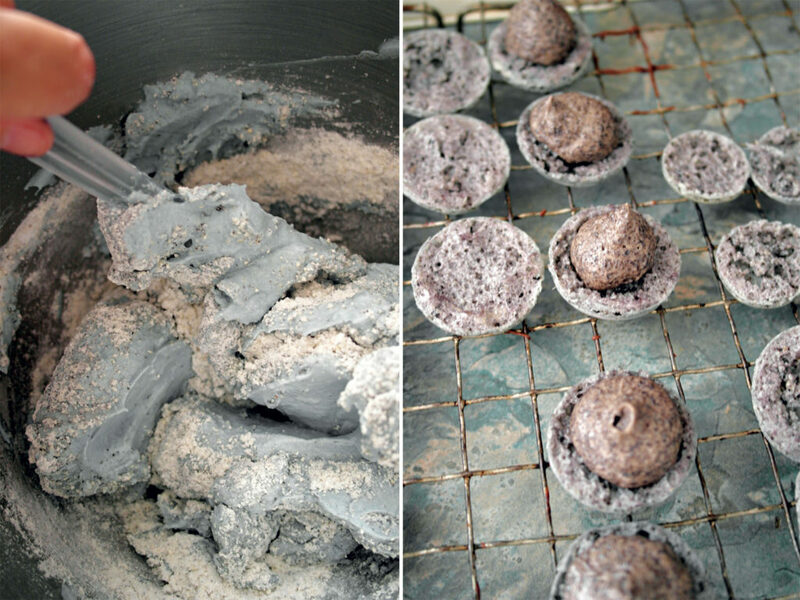 Pipe buttercream onto half the macaron shells (see figure 4), sprinkle with Oreo crumbs and sandwich another macaron shell on top. 1. PULSE the almonds and confectioners’ sugar to form a fine powder. 2. WHIP the egg whites, salt, sugar and a touch of black food coloring until the mixture forms stiff peaks. 3. SIFT in the almond mixture a quarter at a time, but try not to overwork the mixture. 4. PIPE the buttercream onto half of the macaron shells. Photographs and text by Aimee Twigger from Made With Love. Reprinted by permission of Gibbs Smith.